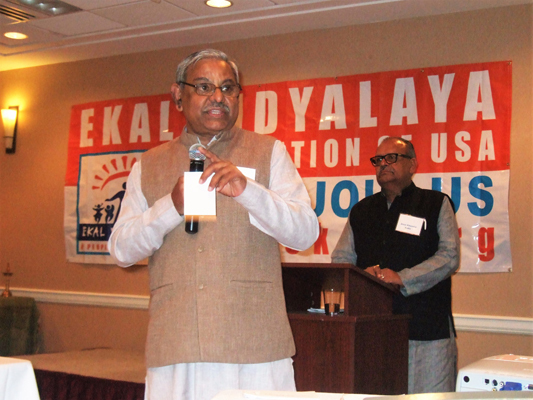 The three day International Conference, in Orangeburg, N.Y., chaired by Dr.Rakesh Sreedhar, chartered a new goal for Ekal Vidyalaya: the present target of one lakh rural and tribal villages (54000 villages outreached- being its tremendous success rate achieved so far) to be enhanced to 6 lakh plus rural and tribal villages, with the innovative and active participation of the enthusiastic enterprising entrepreneurs. 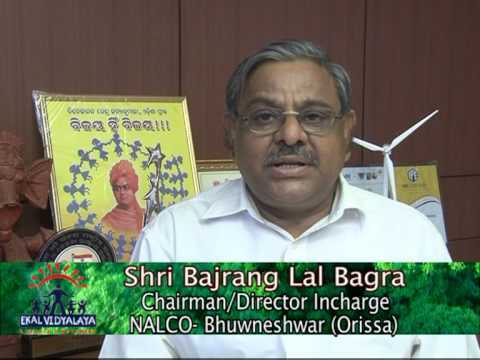 Strategic planning was emphasized, to simplify inner working, making it more user friendly for Ekal Chapters and donors, and create real-time connectivity between Ekal-India and Ekal-U.S.A.
Ekal Abhiyan’s CEO Sri Bajrang Lal Bagra, unveiled plans to train 5000 rural youths a year in digital technology, eradication of Anaemia prevalent among rural women folks initially to be addressed in 300 villages, and nutritional gardens and organic farming to be resorted to massively by GRCs (Gramothan Resource Centres) with modern techniques. Deep-pocket donors were honored with ‘plaques’ for their generosity. The entire smooth sailing of the massive and purposeful conference, thanks to the Houston Office Staff and tenacious volunteers, was concluded by Sri Shrinarayan Chandak, Senior Advisor to the Board of Directors, with a solemn reminder that the entire gamut shall have the grand principle of “One Big Family”. From 1999, Ekal has become phenomenally global, with the USA Diaspora support base catering to one third of the Ekal financial needs. U.S. Support base, besides financial, also helped in Ekal’s vertical growth, in terms of Gramothan and digital empowerment activities along with rural health interventions. The most cost effective Ekal schools, multiplying by large volunteerism and deep outreach all across the country, even in conflict zones that would witness frequent outbreak of hostilities, have enthralled the U.S. Diaspora who respond with an ever increasing phenomenal support in terms of new processes and methods with an added emphasis on technology and digital empowerment. 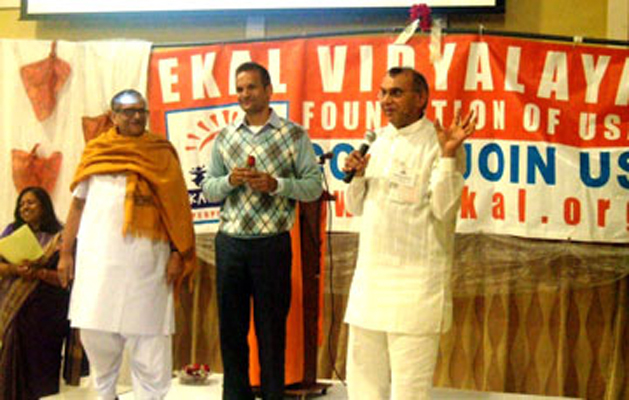 Ekal leaders in India and the US are using weddings as an opportunity to make gifts to Ekal to improve the lives of the villagers. Ekal was the charity of choice at the wedding of Gouri and Abrar, (daughter of Dr. Shubhangi Thakur, the President of Health Foundation of Rural India, Ekal's health initiative) the donation received would enable education upto 30 Ekal schools covering about 900 children. 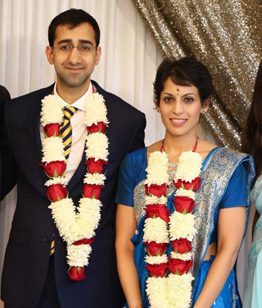 Priyanka, daughter of Neera and DeenTulshian, long time Ekal supporters, and her husband Raj Singh chose Ekal as one of the two charities of choice at their wedding. 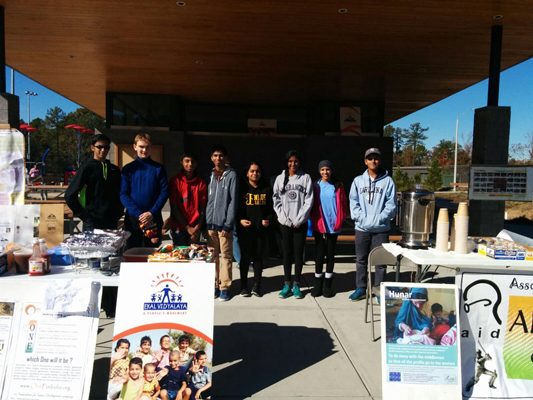 They raised enough funds to support over 20 schools and to support Ekal's health initiatives. 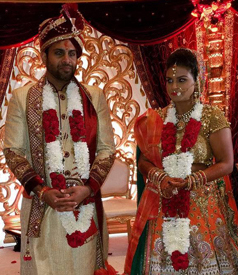 Ekal villagers gave their special blessings to the couple. 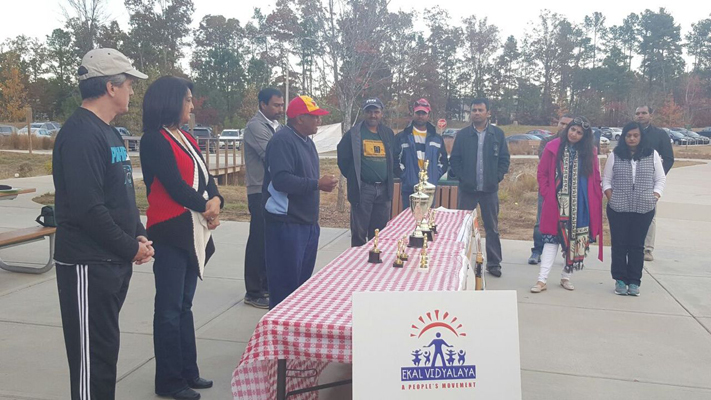 Ekal Vidyalaya and the Triangle Cricket League conducted a cricket tournament in Raleigh – North Carolina and raised sufficient funds to sponsor 8 schools. Mr Alvin Kalicharan, former West Indies cricketer and a formidable batsman spoke few words on behalf of Ekal and the noble work undertaken by the organization, during the Award Ceremony. Environmental sanitation, which includes cleanliness, is one of the major public health issues in India. 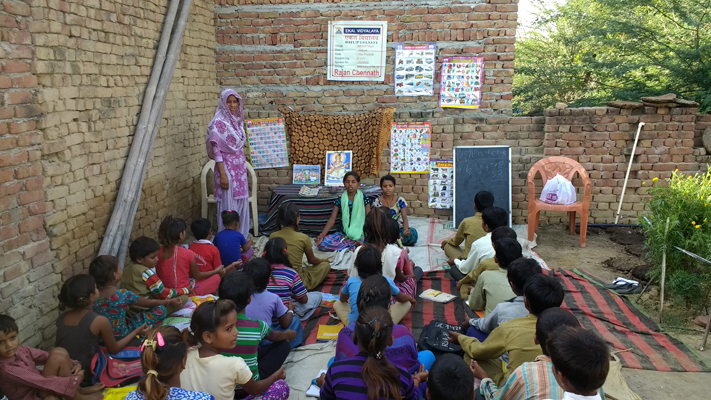 This is the story of the work being done by Arogya Foundation of India, a part of the Ekal Movement, in 30 villages of Jhadol, Udaipur in Rajasthan. In collaboration with the Chip-In Foundation after extensive survey and planning, the work started and the results were very encouraging. The comparison between the baseline and final data clearly demonstrate that the healthcare education can bring significant change in the health of the population by changing the hygiene and sanitation practices. 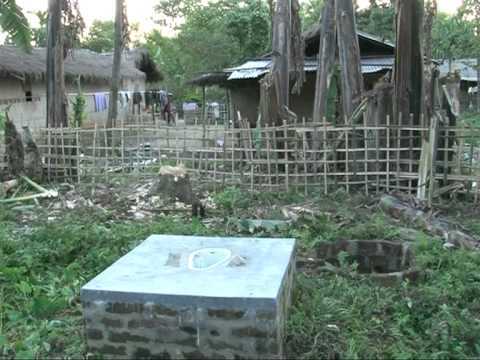 With the help of training of the health workers, awareness of the villagers regarding sanitation and hygiene, kachragaddha (soak pit) and the medical camps, the foundation was able to achieve its aim to improve the health and sanitation condition in all the 30 villages in Jhadol. 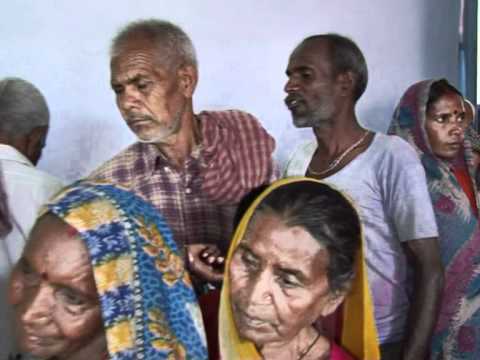 And the result was a significant decrease in the number of patients suffering from diseases such as malaria, diarrhea, scabies, worms, cough, fever etc. Most importantly the average monthly medical expenditure of the household decreased considerably. 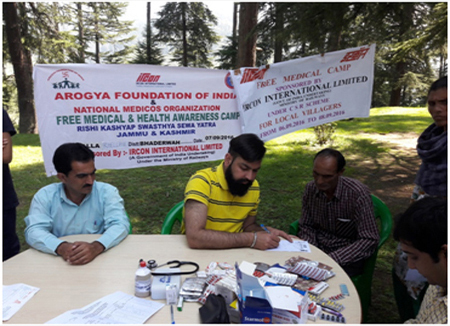 With the support of IRCON International Ltd., Arogya Foundation of India organized 33 medical camps on 6, 7 and 8th November 2016 in distant villages of Jammu & Kashmir. In these camps 2451 males, 2442 females, and 1319 children were benefited. 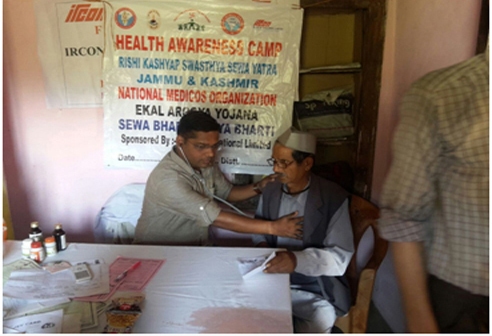 The services provided testing of BP, Blood Sugar, common ailments with distribution of medicines. Health Awareness, Hygiene and Sanitation education were imparted in 20 schools. 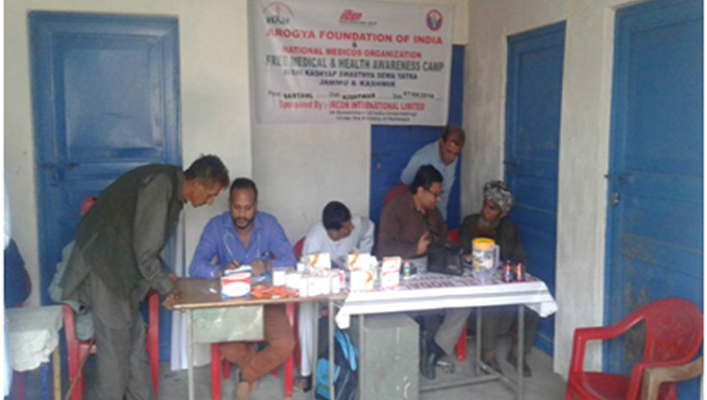 The far flung, hilly villagers- living in an otherwise not easily reachable, inhospitable terrains- by and large, appreciated the medical facilities being provided at their very door steps and desired such medical camps to be organized twice in a year. IRCON International Assistant Superintendent Mr M K V Nair attended the inaugural function. 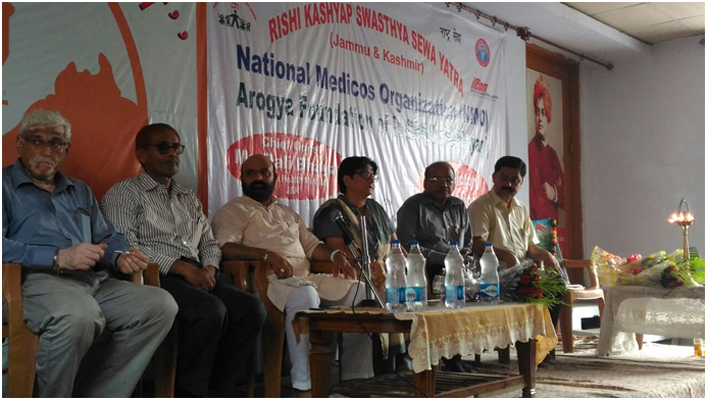 Shri Bali Baghat, J&K Health Minister, who inaugurated the closing ceremony, promised all support for such ventures. The medical students along with the doctors were thrilled with service-orientation. The whole program was a resounding success. Sri Hari Satsang Samithi, Ekal Abhiyan and FTS organized a mass wedding of 51 tribal couples on 20th November 2016. This historic event was solemnized with full traditions and customs with Jharkand Governor Smt. Draupadimurmu gracing the occasion. The bridegrooms took a collective pledge to have a consecrated life and become free from any kind of addiction and promise to work for the betterment of all in their villages. 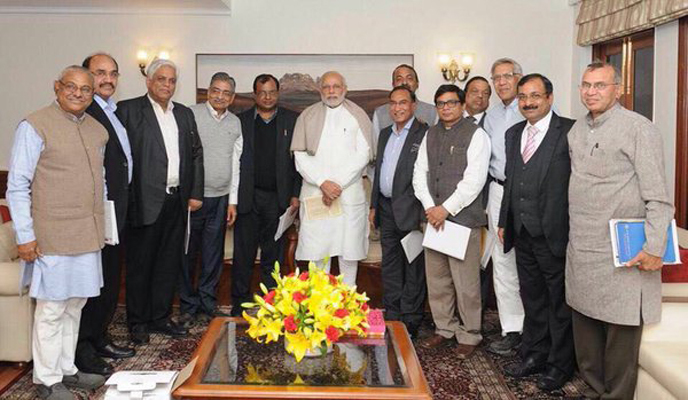 Measures such as this will go a long way in bringing awareness and harmony in the country. 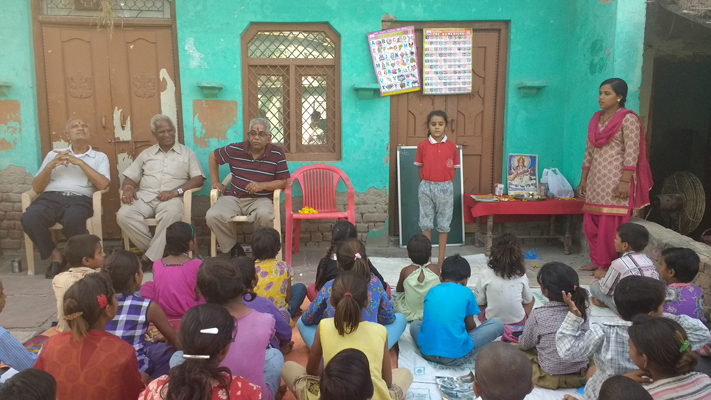 Subhash Agrawal from Dracut, United States visited Ekal Vidyalaya in Mathura. He visited two schools in Uchha village and Bhitthalnagar village. He was very happy to see smiling faces of small children and teachers at school. 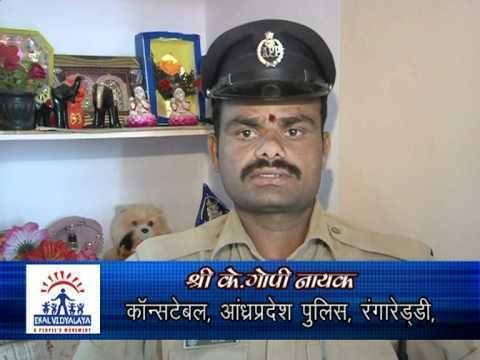 He felt that the Kids are being given quality education by Ekal Vidyalaya.